The dish I am sharing with you today has been a family favorite for many years. My dad is a french chef, having worked his whole life in hotels, restaurants, embassies, and most importantly our home. Growing up in a family with a strong french influence in food made for an interesting childhood. I grew up eating bouillabaisse, frog legs, escargot, and rabbit. While my friends in school had bologna sandwiches for lunch, I had a strip steak on a french baguette. I never knew what bologna tasted like, never had a peanut butter and jelly sandwich, or a hot dog until I was in my 20’s. At the time, I didn’t realize how different my lunches were, but looking back I appreciate what my dad brought to the table…..literally! One dish my dad made often when we were growing up was French scalloped potatoes. This dish is definitely comfort food in it’s highest form. I make this dish when I am feeding a large group such as when family comes over to visit (I like to show my skills off to my dad). My dad never owned a mandoline, he was an expert at cutting thin potatoes slices with a knife and his dishes came out perfect every time. Me, not so much, I need a mandoline! I purchased this German made King of all Mandolines (HERE) close to 10 years ago, and it still works as if it was purchased yesterday. The blades are still very sharp, and the slicer has several different settings to vary slices for thickness. The other blades included in the set are to julienne, shred or cube vegetables. They look so professional when creating a vegetable tray for guests. For this recipe, I used the slicer set to position 1, which creates very thin slices. I find it easiest to use a cutting board with a strainer (SIMILAR HERE) to slice and collect the vegetables. The board sits on top of the sink. Once I have the potatoes peeled, it’s time to start slicing. The mandoline is so easy to use and the strainer catches the peeled slices. Next, heat the cream in a saucepan over medium heat, add salt and pepper to taste. You don’t want to boil the cream, just heat it up. Also, heat the oven to 350 degrees. For this recipe I am using my favorite white porcelain baker dish (HERE). It comes in multiple sizes. Perfect for a recipe using 5 lbs of potatoes. Grease the casserole dish with 1 tablespoon butter. 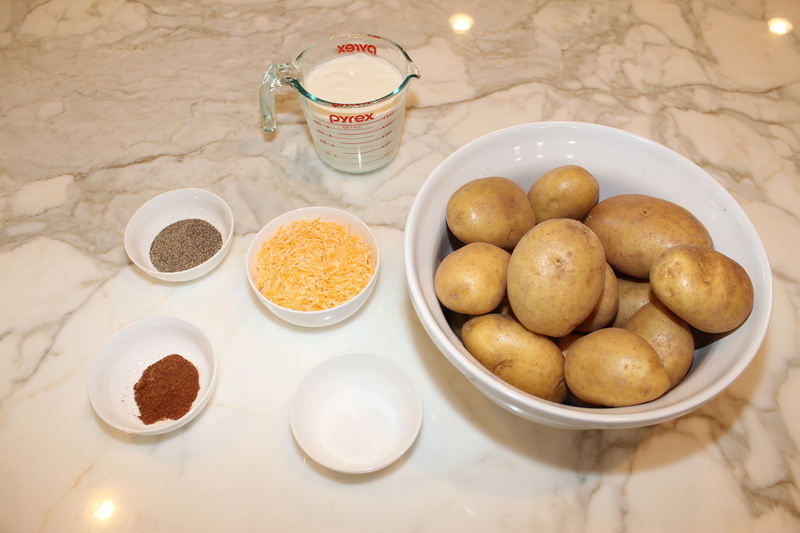 Start by layering the potatoes in the dish, overlapping them slightly. In between each layer, add salt, pepper and nutmeg. Continue to layer until all the potatoes are gone. Fold the cheese into the cream sauce. Add the cream sauce to the potato casserole. Bake at 350 degrees for 1 hour 30-45 minutes. Press down on potatoes with spatula every half hour. Volia! You have a great dish everyone will enjoy. Next Post Modern Farmhouse Shiplap Bathroom Update – Sealant Needed!